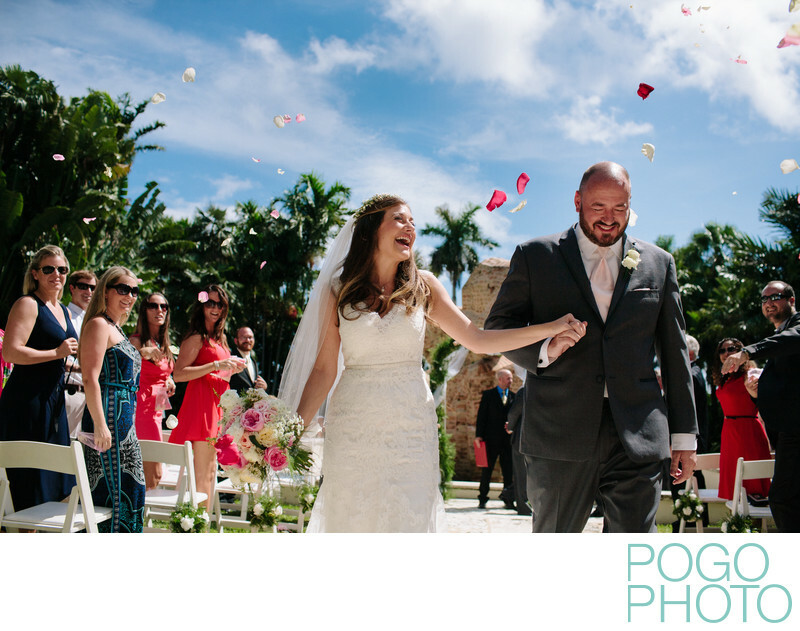 This enthusiastic exit from their morning ceremony is made even more tropical with the soaring palm trees, the bright pops of color from the guests, and the sunglasses worn by everyone in their seats. Mid morning weddings can be extremely hot, so having ice cold beverages on hand for the time immediately following is a must. The Ann Norton Sculpture Gardens in West Palm Beach has a wide open courtyard facing the large sculpture in the center pool, but with the beaming sun overhead things tend to heat up quickly. We love that despite the heat all of the guests in this images are thrilled to witness their friends getting married, and the ocean breeze that carries the petals up in the air and surrounding the happy couple. For an ideal petal exit to work it's essential to coordinate with the officiant, who can convey your instructions to your guests before the ceremony begins, remind them just before your kiss, and then tell them when to begin as you start to exit. Just like any sort of group activity this is, of course, up to your family and friends whether or not they will be coordinated enough to throw the petals at the right moment, but being prepared and walking them through it several times definitely helps bring the odds up! Location: Ann Norton Sculpture Gardens, 253 Barcelona Road, West Palm Beach, Florida 33401. 1/8000; f/4.0; ISO 200; 35.0 mm.